White Oak Limestone Floor and Wall Tile adds visual interest to any residential or commercial setting, transforming countertops, walls and floors into sleek, contemporary expanses. This 12 in. x 24 in. marble-like polished stonework from MS International is resistant to moisture and frost, so it’s an exceptional choice for outdoor applications in addition to supplying bathrooms and kitchens with eye-appealing distinction. It has an assortment of gray streaks and linear patterns amid a random variation of warm and cool white tones to complement a variety of design styles. Note: Inspect all tiles before installation. Natural stone products inherently lack uniformity and are subject to variation in color, shade, finish, etc. It is recommended to blend tiles from different boxes when installing. Natural stones may be characterized by dry seams and pits that are often filled. The filling can work its way out and it may be necessary to refill these voids as part of a normal maintenance procedure. All natural stone products should be sealed with a penetrating sealer. 10 sq. ft.; 5 pieces per case; case weight is 60 lbs. Buy online MS International White Oak 12 in. x 24 in. 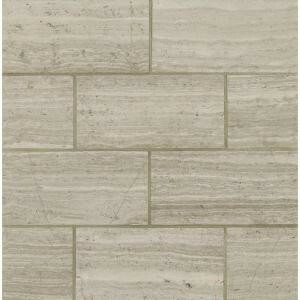 Polished Limestone Floor and Wall Tile (10 sq. ft. / case) TWHTOAK12240.38P, leave review and share Your friends.